This one is going to be highly entertaining. 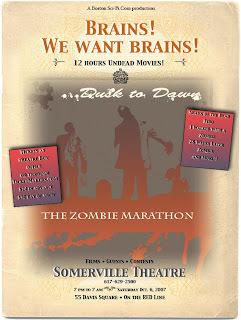 The Somerville Theater in Davis Square is hosting Zombie Fest: From Dusk Til Dawn this upcoming Saturday night. Be forewarned, this is not for the faint of heart. From 7pm until 7am (that's right 12 straight hours) they will be showing a veritable marathon of zombie movies. Tickets are $30 bucks at the door or $24 in advance. They've got some good movies lined up. Shaun of the Dead, which was hilarious. 28 Weeks Later, which I haven't seen but I'm sure it's good. And then various other zombie movies which may or may not be good. But here's the best part: beer and wine is available. Soooo.......kick back, relax, have a drink, and watch a zombie movie (or 6 zombie movies for that matter). Bring your friends cause you're going to need someone to poke you when you start nodding off around 4am. Brains! We Want Brains! What a coincidence, that's MIT's motto too. 0 Response to "Zombie Fest: From Dusk Till Dawn - 10/6"